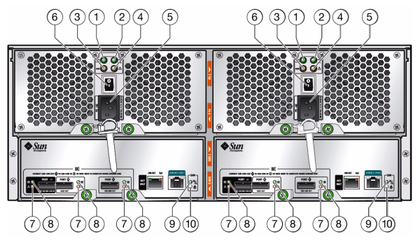 The Sun Disk Shelf SAS-2 is a high-availability serial attached SCSI (SAS) device in a 4U, 24-disk chassis. Refer to Disk Shelf Tasks for procedural information about replacing disk shelf components. 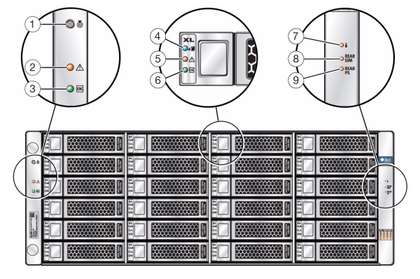 The main components are hot-swappable, including the SAS Interface Module (SIM) boards and drives, and the dual load-sharing power supplies and fans. This provides a fault-tolerant environment with no single point of failure. System faults are indicated by an amber colored light on the front panel. Following is the list of replaceable components of the Sun Disk Shelf SAS-2. The SAS-2 (Serial Attached SCSI 2.0) storage fabric supports greater number of targets, greater bandwidth, higher reliability and bigger scale. The scale and reliability improvements are achieved with 2 TB SAS disks you can daisy-chain to a total of 12 shelves (288 total disks). In addition,the new, high-performance SAS-2 HBA is designed for the Sun Storage 7000 series with a standard chip set to support a high-density of target devices, capable of attachment to 1024 targets. With this new fabric, you are encouraged to apply entire shelves to pools, so you can get the benefits of No Single Point of Failure (NSPF) configurations and striping across the maximum possible number of devices. Power supplies and fans, SIMs, and disks are hot-pluggable on the storage shelf. The following figure shows the exterior of the power supply. Power supply 0 is on the left and power supply 1 is on the right. The following table shows the shelf drive locations. The following figure shows the Sun Disk Shelf front panel. Up to four Logzilla SSDs are supported per disk shelf. Logzilla SSDs should be populated in order of slots 20, 21, 22, and 23. 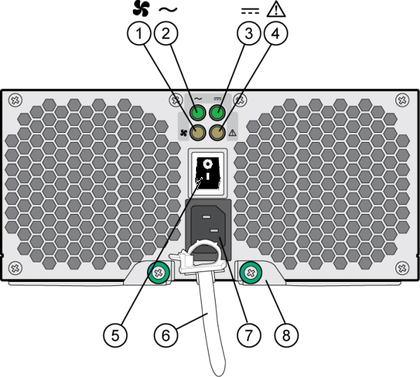 The following figure shows the drive assembly exterior for the Sun Disk Shelf. The following figure shows the SIM board exterior of the Sun Disk Shelf SAS-2 and is described in the Legend. SIMs are hot-pluggable on the shelf. The following figure shows the SIM board and Power Supply exterior indicator LEDs. SIM 0 is on the left, and SIM 1 is on the right. The following tables describe and provide part numbers for the supported expansion storage shelves. Sun Disk Shelf 1TB 7.2Krpm, SAS-2, 3.5"
Sun Disk Shelf 2TB 7.2Krpm, SAS-2, 3.5"